Happy 2018 everyone! 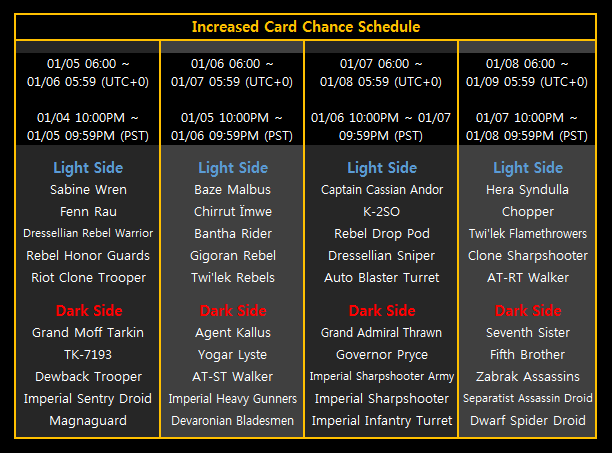 We hope you all enjoyed the Year End Special of the Increased Card Chance event. To start of the New Year, here’s another Increased Card Chance Event with a different set of Leaders and Units! ※ The Tiers of the Card Packs in the Shop will change according to the player’s Tier for each Faction. Different types of Cards are available depends on the Card Pack Tier. ※ The schedule of the increased card chance will appear in the Shop. Players will also be able to check the cards they can get in each Card Pack.